Secure the flanges with five sheet metal screws. 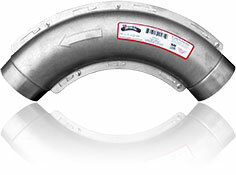 Model LT90 should be measured as 1-1/2 feet against the total allowable duct length. See engineering information based on ASHRAE calculations and code references: 2012 IMC Table 504.6.4.1 and IRC Table M1502.4.4.1 for 10" radius fittings. When used with the Model 4D “Down” Dryerbox®, cut and insert a 3” long section of snaplock pipe to transition into port for adequate flex connection.